Candice Jaynes obtained her degree in veterinary technology from Saint Petersburg College in Florida and has been in the field for over 11 years. 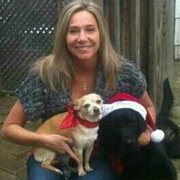 She currently works full time at Broadway Animal Hospital, a 4 doctor small animal hospital/emergency clinic, as an LVT. She was in the human medical field for 13 years before switching careers because of her true love of animals. She has been with SOS since August 2012 and says she “…love[s] every minute of it. It makes me feel so accomplished to be able to help SOS fulfill their goals.” She is a mother of 2 teenage boys and 3 dogs. She otherwise keeps busy with the gym, hiking, camping, concerts, and any other outdoors activities.